HANCEVILLE – It wasn’t Tuesday, but it was still taco day for the Hanceville City Council at its meeting Thursday evening. Council members and visitors viewed concept art for the new Taco Bell that will go up on the site of the old Hardee’s across from Wallace State, and heard about construction plans. Developers will demolish the Hardee’s building and begin construction of an entirely new structure before the end of September, with the goal of having Taco Bell open for business before Christmas. 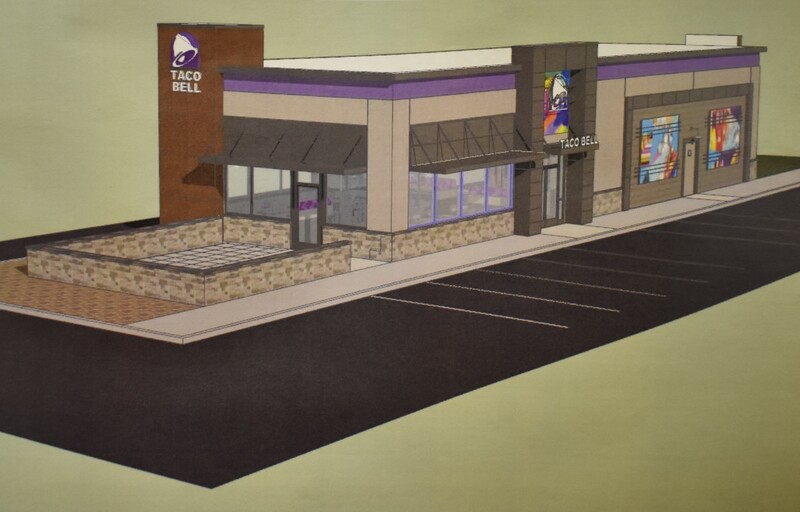 After the meeting, Mayor Kenneth Nail told The Tribune, “Last week, folks from corporate Taco Bell called us and told us they had decided to build a Taco Bell in Hanceville, and they had a very tight schedule, and they wanted to move rather quickly. So, after speaking with the chairman of the planning commission, Rick Cason, they pretty much immediately–just within like two days–called a planning commission meeting. They reviewed the plans and approved that. In other news, Nail told the council that Hanceville does not appear to have gotten a Transportation Alternatives Program (TAP) grant for improvements along Alabama Highway 91. He reported, though, that he met with engineers and feels that the City’s public works staff can actually complete the project for less than Hanceville would have had to pay in matching funds toward the TAP grant. He also said that the City will make another TAP grant application for funds to make improvements to Church Street. The City now has its fountain for Hamby Park, after Nail and other staff made a trip out to El Paso, Texas to pick it up from the manufacturer. The mayor also reported that he found while there that the manufacturer also produces street light poles that could be purchased, finished, and set up for a fraction of cost estimates the City has reviewed from several retail dealers. He hopes to install attractive street lighting to complement sidewalks and other street improvements around town. The Hanceville City Council’s next meeting will be Thursday, Sept. 27 at 6 p.m. in the Hanceville City Hall auditorium, with work session at 5:30. The public is invited to attend.